Archives for 2014 | What Is New With NeoFinder? NeoFinder for iPhone and iPad is here! We are incredibly happy and proud to give you NeoFinder for iOS! After three years of hard work, and countless hours pouring over the details of bringing the power of NeoFinder to this small device, we have released NeoFinder iOS 1.0, and Apple has approved it to the Apple App Store. It was quite an accomplishment to make the mighty NeoFinder work with the little memory and small screen of the iPhone or iPad, but we made a nice and compact iOS version of this amazing Digital Asset Management tool for you. Keep the NeoFinder catalogs of your entire digital library always with you! Use Dropbox or iTunes to upload your NeoFinder catalog files to your iPhone or iPad. 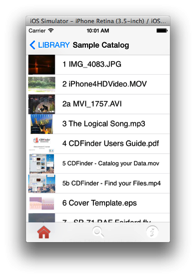 Find your photos, movies, songs, and any cataloged data quickly on your iPhone or iPad, wherever you go. Limit the search to only photos, songs, or movies. The Inspector shows you all the details of your cataloged files, including Previews, EXIF, IPTC, ID3, XMP, song lyrics, cover art, if they are included in your catalogs. Geotags of photos or movies are displayed on the map. Geosearch for all photos or movies within the visible range of the map. "Since NeoFinder v6.6 is available for download as a trial, we recommend giving it a try for yourself if you're on the hunt for something to help organize a notable breadth of digital information. Since it is indeed a comprehensive tool for managing a catalog (of which we can't thoroughly cover in a brief review), we feel that those who will benefit most from NeoFinder are companies, ranging in size, that require detailed aggregation of files they hold onto." NeoFinder 6.6 for Yosemite released! Shortly after the release of Apples new operating system Mac OS X 10.10 Yosemite, we are happy to announce an amazing new NeoFinder version which uses the new abilities and has a lot of improvements for older Mac OS X versions as well! NeoFinder 6.6 is certified to run in Mac OS X 10.10 Yosemite! After more than two years of development effort, we are incredibly proud to announce NeoFinder for iOS! NeoFinder is the very first tool of this kind to offer your digital media catalogs "to go" on your iPhone or iPad! We are about to launch the Beta Test, so if you are a licensed NeoFinder or abeMeda for Windows user, and you wish to take your catalogs with you on your iPhone or iPad, please contact us, we still have a couple of spots open for the Beta Test. 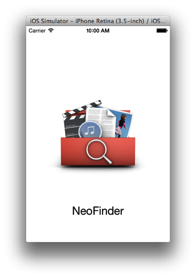 Only NeoFinder for iOS will allow you to search your NeoFinder catalogs on the iPhone or iPad, wherever you are! NeoFinder for iOS will be officially released after the successful Beta Test and after Apple has approved it for its store. Stay tuned! 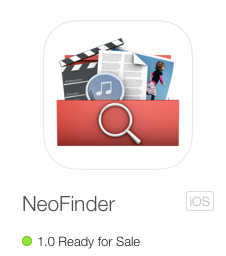 We are incredibly happy and proud to present the another big version of NeoFinder to you! The AutoUpdater now allows each catalog to be added more than once, so you can now update a catalog multiple times a day, if you want to! The Tags are now displayed in the Inspector in a special new field, which allow you to select one and search for it!